The main wall in a local bakery/coffee shop is a vintage china lover's dream. Don't ask me how all those plates are attached. Perhaps epoxy, as no hardware shows. It's a good example of how a large group of anything can make an impressive statement. 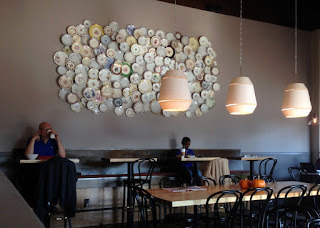 Care has been taken to make all the plates relate as a unified group, overlapping them, while still leaving a little space for the wall to show through, here and there. The more time I spent looking at it, the more I noticed the differences in the sizes, colors and patterns of the plates. A tight mass of similar somethings accentuates the differences between all those somethings. It's a design lesson mounted on a wall.